1. Prepare outdoor grill for direct grilling over medium-high heat. In small bowl, stir brown sugar, coriander, thyme, garlic powder, ginger, salt and pepper until well combined. Evenly coat both sides of pork chops with spice mixture. 2. 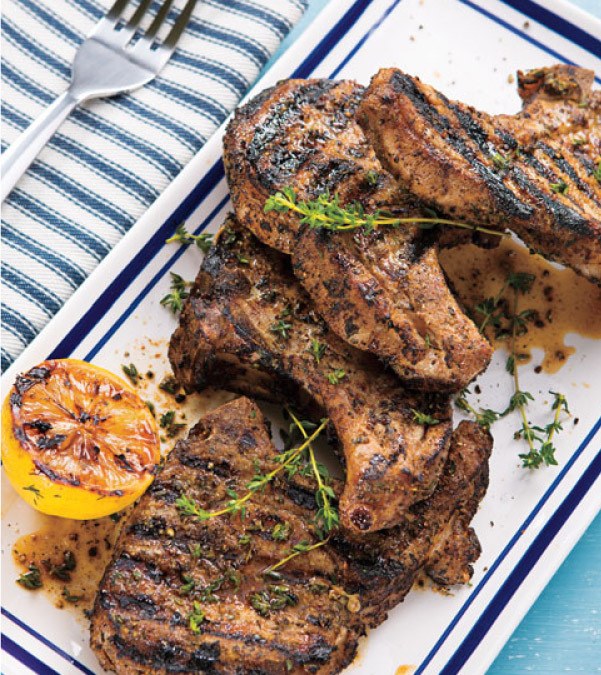 Place pork chops and lemons, cut side down, on hot grill rack. Cook pork chops 10 to 12 minutes or until internal temperature reaches 145°F, turning once halfway through cooking; cook lemons 5 to 6 minutes or until light grill marks appear. 3. Transfer pork chops and lemons to serving platter. Loosely cover with aluminum foil and let stand 5 minutes. Serve pork chops with lemons for squeezing over pork.